The commercial video editing company Friendshop launched last year and needed its own space to expand its growing team. Murdock Solon Architects worked with the company to transform an entire floor in a warehouse-style building in New York’s Chelsea neighborhood. 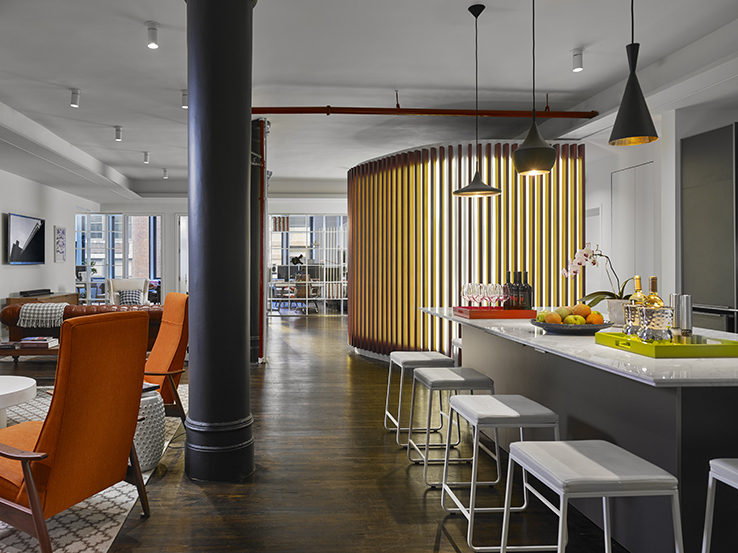 MSA helped create the ideal space for ultimate creativity while meeting intense technical demands. MSA designed private offices along the perimeter with centralized communal spaces. The private offices were lined with glass walls to bring natural light to the center space. Custom white lacquered shelves were added for the display of each editor’s individuality, as well as to add additional privacy. The central shared space utilizes eclectic mid-century modern furniture to divide the space, and a large kitchen island doubles as an informal conference table. A curved wall constructed of walnut louvers lit from behind further divides space while adding to the overall aesthetic. The final result is a high-energy, yet comfortable space primed for expanding business. View more about the project here.